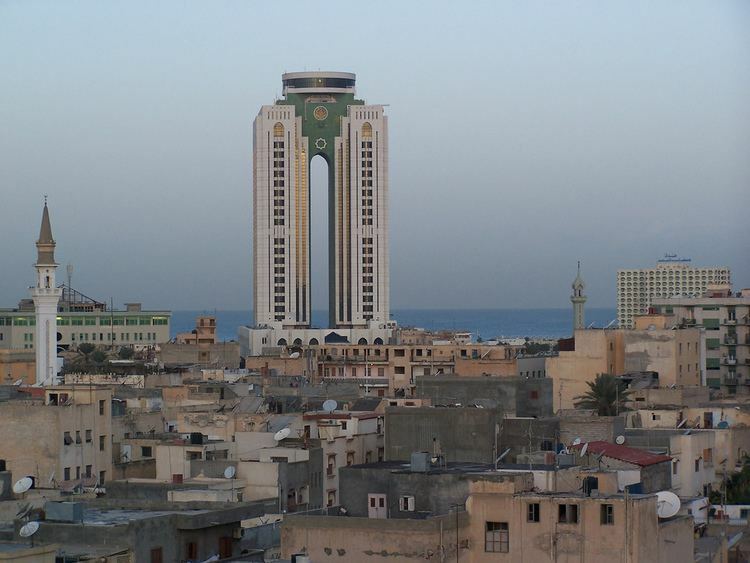 Tripoli (Arabic: طرابلس‎‎, Ṭarābulus; Berber: Ṭrables) is the capital city and the largest city of Libya. 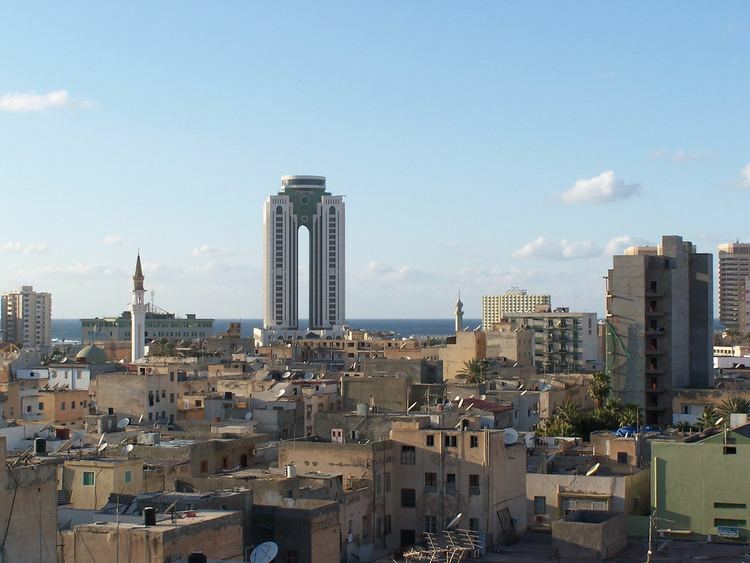 Tripoli, with its metropolitan area, has a population of about 1.1 million people. The city is located in the northwestern part of Libya on the edge of the desert, on a point of rocky land projecting into the Mediterranean and forming a bay. 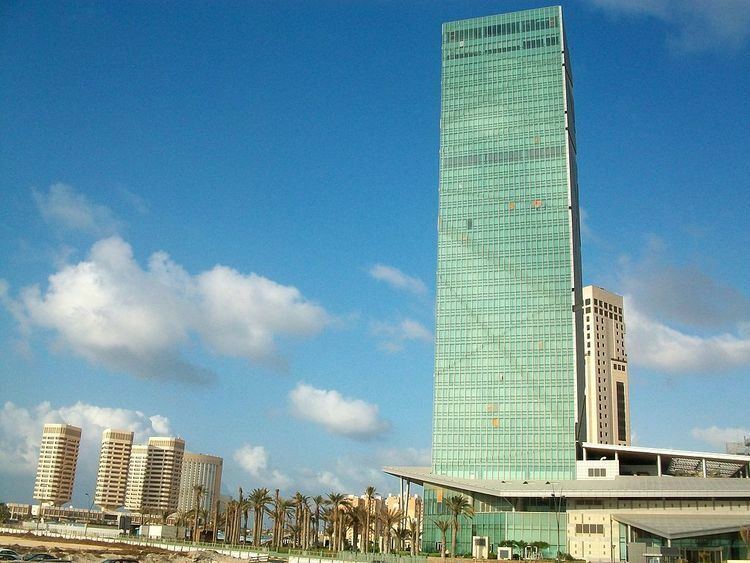 Tripoli includes the Port of Tripoli and the country's largest commercial and manufacturing centre. It is also the site of the University of Tripoli. The vast Bab al-Azizia barracks, which includes the former family estate of Muammar Gaddafi, is also located in the city. Colonel Gaddafi largely ruled the country from his residence in this barracks. Tripoli is also known as Tripoli-of-the-West (Arabic: طرابلس الغرب‎‎ Ṭarābulus al-Gharb), to distinguish it from its Phoenician sister city Tripoli, Lebanon known in Arabic as Ṭarābulus al-Sham (طرابلس الشام) meaning "Levantine Tripoli". It is affectionately called The Mermaid of the Mediterranean (Arabic: عروسة البحر‎‎ ʼarūsat el-baḥr; lit: "bride of the sea"), describing its turquoise waters and its whitewashed buildings. Tripoli English: is a Greek name that means "Three Cities", introduced in Western European languages through the Italian Tripoli. In Arabic: طرابلس‎‎ it is called Ṭarābulus ( pronunciation , Libyan Arabic: Ṭrābləs pronunciation , Berber: Ṭrables, from Ancient Greek: Τρίπολις Trípolis). Compare Sanskrit, "tri" meaning the number 3, and "pura" meaning a fortress, castle, city or town. Hence, in Sanskrit "Tripura" also means "Three Cities". In 1510, it was taken by Pedro Navarro, Count of Oliveto for Spain, and, in 1523, it was assigned to the Knights of St. John, who had lately been expelled by the Ottoman Turks from their stronghold on the island of Rhodes. Finding themselves in very hostile territory, the Knights enhanced the city's walls and other defenses. 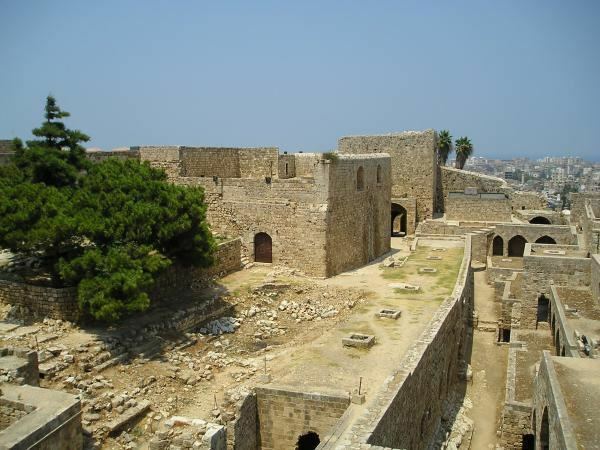 Though built on top of a number of older buildings (possibly including a Roman public bath), much of the earliest defensive structures of the Tripoli castle (or "Assaraya al-Hamra", i.e., the "Red Castle") are attributed to the Knights of St John. Colonel Muammar Gaddafi became leader of Libya on September 1, 1969. The city also played host to the Italian Super Cup in 2002. The Africa Cup of Nations were to be played in Libya, three of the venues were supposed to be in Tripoli, but it was cancelled due to the ongoing conflict of the Second Libyan Civil War.